Stroll through the flooring section of any large home improvement warehouse and there you find floating cork floor tiles. Versatile and unique, this is a flooring option you should seriously consider. Cork has been one of mankind's most useful materials for 5,000 years. Found in fishing tackle in China, Egypt, Babylon and Persia dating back to circa 3000 BCE, the use of this remarkable material is approximately as old as writing! Over the centuries, it has been found in such artifacts as floats, stoppers for casks, women's footwear and roofing materials. The most familiar use for cork, the closing of wine bottles, dates from First Century BCE Greece. Today, cork can be found in almost everything including building materials where it is a viable alternative to hardwood, stone and ceramic floors. The only real drawback in spite of the new polyurethane coatings used is that certain footwear, high-heeled shoes, for example, can and, in most cases will, mar the surface. 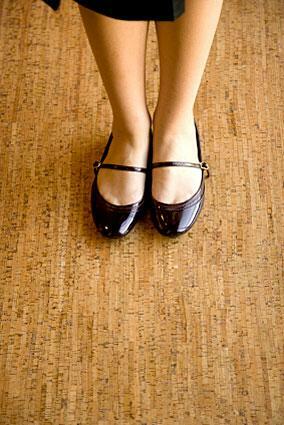 Cork tiles are, therefore, perhaps best enjoyed barefoot. Installation of these engineered tiles is simple and straightforward. Depending on the sort you bought, you may or may not have to glue them together. One thing you should invest in is the manufacturer's installation kit. Within you will find such useful items as a tapping block, wall spacers to ensure a consistent expansion gap at the edges, and a pull-bar, which you'll need for hammering the tiles into position next to walls. Place 6ml plastic sheeting over the whole floor that runs three inches longer and wider so it overlaps. Use tape to keep it down. On top of the plastic sheet, place a closed-cell foam or fibre underlayment and seal the edges with duct tape. Begin in the center of the room, lay the tiles out in the pattern you have chosen without securing them so you have an idea of what to cut. Clean up and vacuum the floor and then it is time for the top coat. Work in an even, single pass over the floor. Do not apply it as if you are painting it on. You may use a roller or, for better results, a pull foam applicator. That's it, except for the hardest part of the installation: Now you wait. Generally, it will be a good four hours before you can walk on it barefoot. In a day you will be able to wear shoes on the tiles, though it will still be several days before you can wear rubber soles on the floor without worrying about the finish. It is at that point you should be able to cover the expansion gap at the edges of the floor by replacing the baseboards or installing quarter rounds or cove molding if, at the beginning, you chose not to remove the baseboards. When you do this, make sure not to nail the trim to the floor since that will lead to buckling. The finish will not be fully hardened for eight to 10 days and it should not be covered with plastic or carpet during this time. Finally, because it is the finished top coat that protects the tiles from moisture damage; do not clean the floor with water for two weeks after installation. Bear in mind that this surface is natural and is certainly more delicate than ceramic tiles, a fact reflected in its maintenance. The most basic thing you can do is to vacuum the floor for dust and loose dirt at least as often as you vacuum your rugs. This will help keep the surface of your floating cork floor tiles clean and help protect it from damage. For stains or spills, a damp mop and a mild, ph-balanced dish soap is indicated. Be careful because if your mop is too wet, the water can seep between the tiles and damage them, as can ammonia and abrasive cleaning products. There is no doubt that tile of almost any sort, properly and artistically laid, will increase the beauty of your floors. However, in using floating cork floor tiles you will also add comfort and warmth that cold stone or hardwood cannot match, not to mention a new level of peace with cork's sound dampening qualities. It is a unique and interesting addition to any decor and one, as you peruse the floor section of your local home improvement warehouse, that you should consider.